We have had a heat wave for the month of September with temperatures in the 90’s. So, I’m always looking for candles at our local Goodwill. 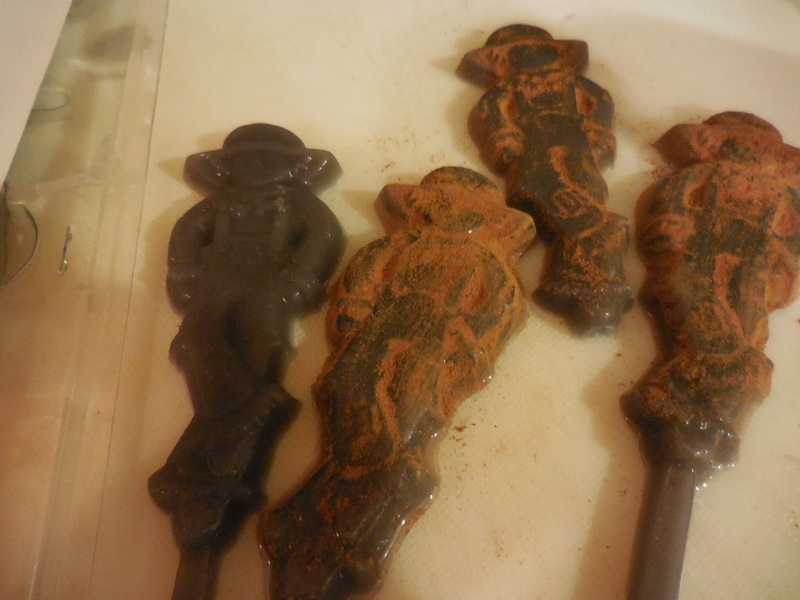 Yesterday, I happened to find some black ones! 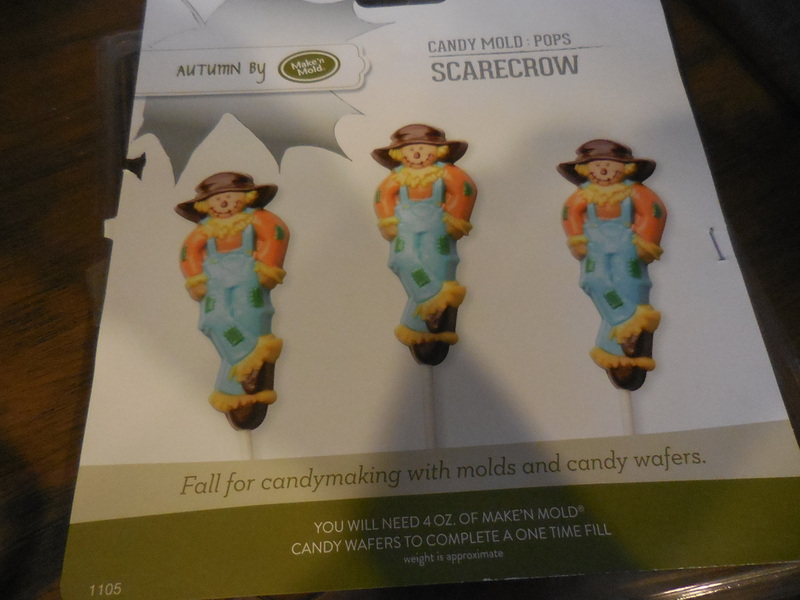 And, not only did I find the candles, I found two scarecrow candy molds. Perfect!! so I had the whole evening to do my thang! 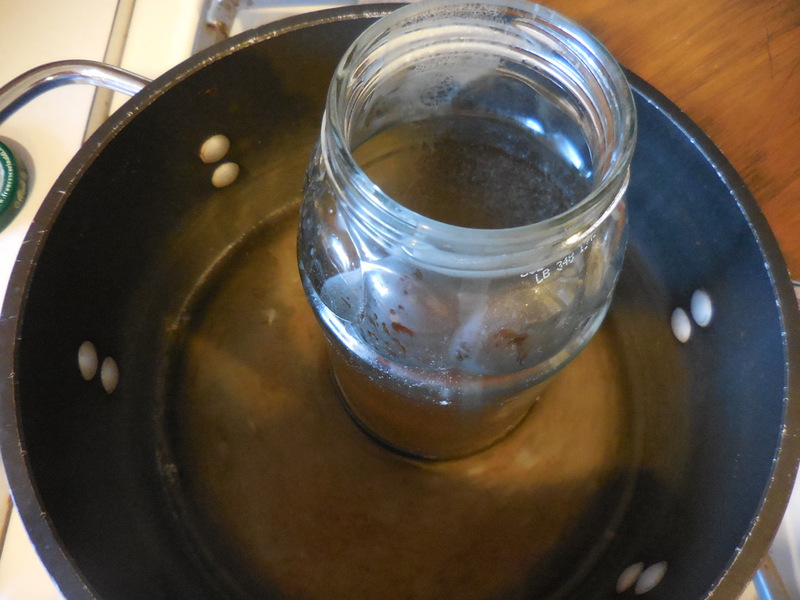 First, I melted the wax candles by putting them into a glass jar, or you could use a clean vegetable can. 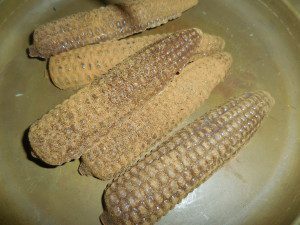 Put it in a pan with water and melt them on top of the stove. I used one black candle and several small white candles (left over from last years Christmas Eve Service at our church…they were throwing them away so I took them). There is enough black that the white candle wax disappears. 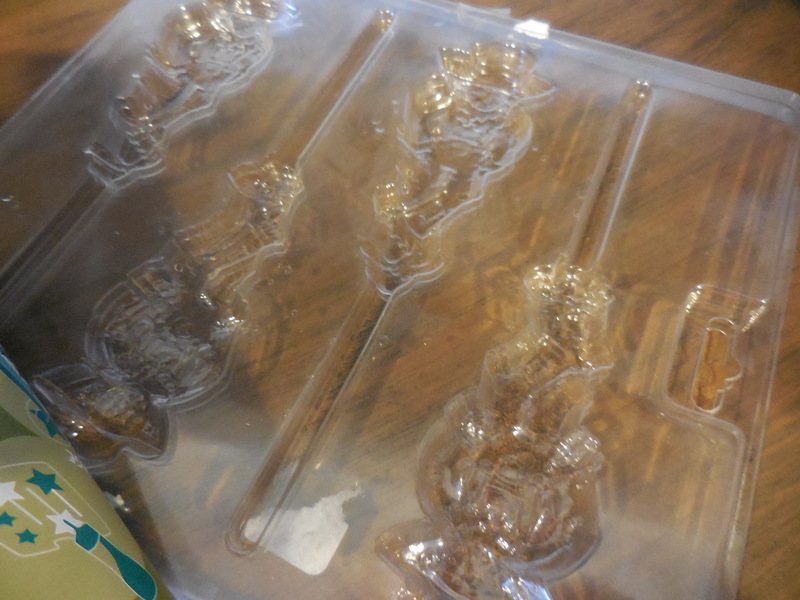 Once the candles melt, carefully pour into your molds. 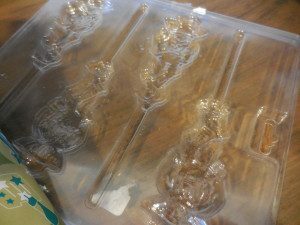 Let the wax cool completely, or you can let them cool until they are no longer liquid then pop them into the freezer for 5-10 minutes. I like to do it that way because they come out so easy once they are really cold. 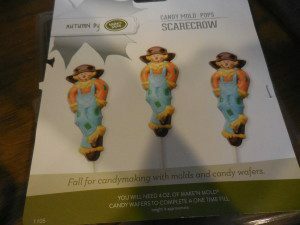 Since my molds were for candy on a stick, the wax also ran down into the stick part so I have a wax stick at the end of the scarecrow. You could break this off, but I left them on so they would be taller in my arrangement. 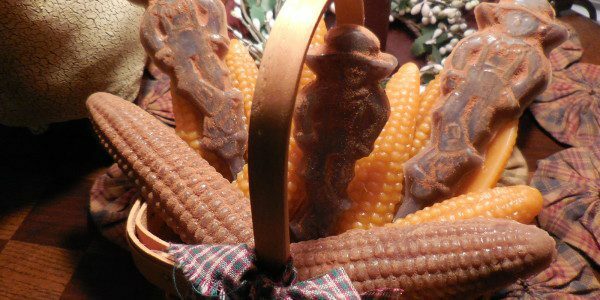 Or you could put a little wax where the stick part and scarecrow part meet, let it cool so it won’t allow the hot wax to run down the stick part and then pour the rest of the wax into the mold. 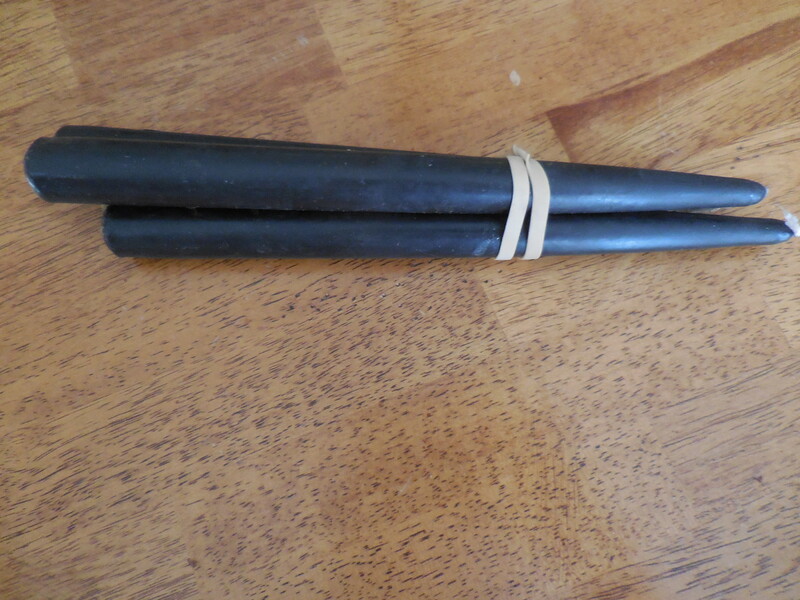 If you were doing them for bowl fillers, you would just cut this part off. 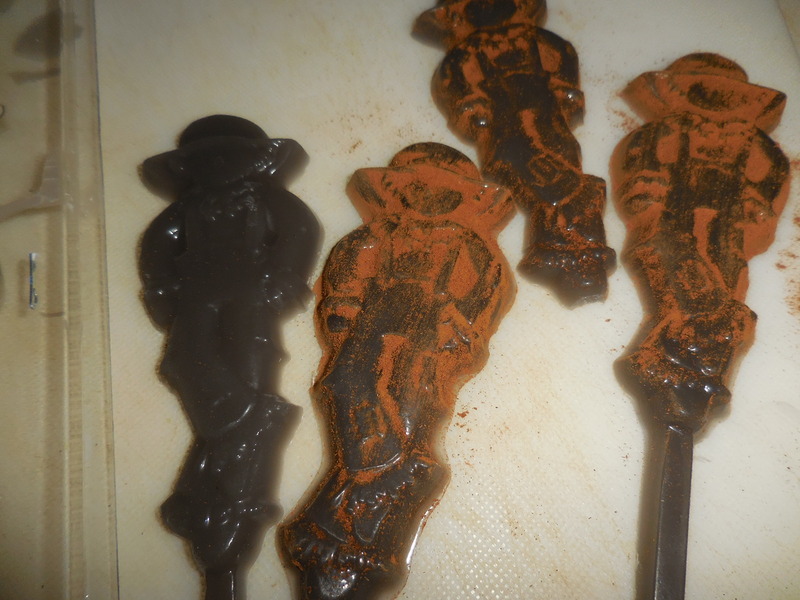 I put some cinnamon into a plastic baggy and coated the wax scarecrows with the cinnamon. Dust off the access and you are done! This really makes them look primitive! 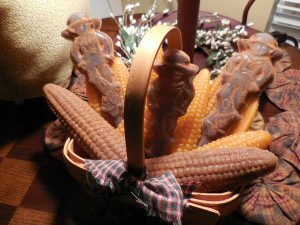 I put them into this basket that I already had filled with corn molds I made using the same technique. I bought a brown wax cupcake candle at the Dollar Tree for the corn and used a cast iron mold. The orange corn I used an orange candle I bought at Goodwill. 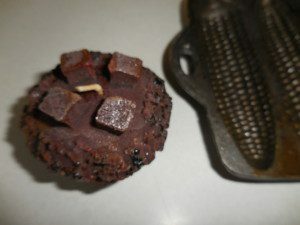 The cinnamon makes them smell good and gives you that primitive look! 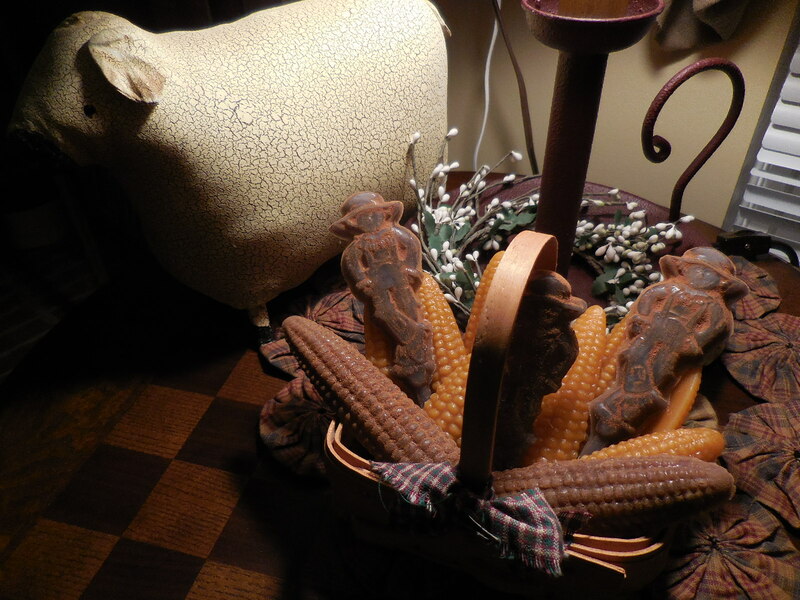 It sure beats paying a lot of money for these at the prim shops! 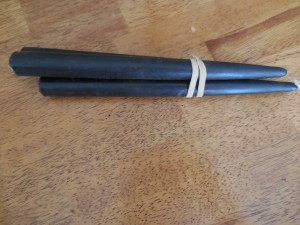 I hope you give it a try, but be prepared to be hooked if you do!